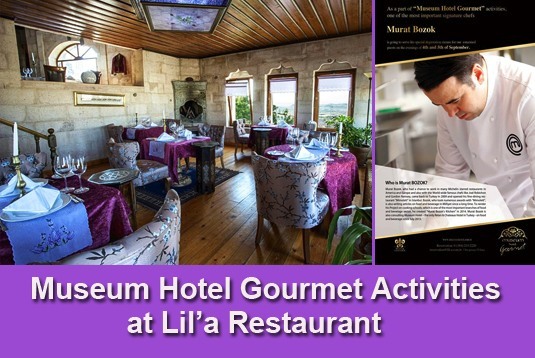 As part of Museum Hotel (Uçhisar-Cappadocia) “Gourmet” activities, one of the Turkey’s most important signature chefs, Murat Bozok will serve his special degustation menus as a “Guest Chef” at Lil’a Restaurant, on the evenings of 04th and 05th of September. Murat Bozok, who had a chance to work in many Michelin starred restaurants in America and Europe and also with the world-wide famous chefs like Joel Robichon and Gordon Ramsay, came back to Turkey in 2009 and opened his fine-dining restaurant “Mimolett” in Istanbul. Bozok, who took numerous awards with Mimolett, is also writing articles on food and beverage in Milliyet since a long time. To tender his project on cooking schools, which is one of the most important branches of food and beverage sector, he created “Murat Bozok’s Kitchen” in 2014. Murat Bozok is also consulting Museum Hotel -the only Relais&Chateaux hotel in Turkey- on food and beverage since July 2015.